Cyril Pahinui, Crown Prince Of Hawaiian Slack-Key Guitar, Dies At 68 Pahinui, who succumbed to health complications possibly caused by exposure to Agent Orange while serving in Vietnam, was drawn at a young age to the backyard sessions his father regularly held. 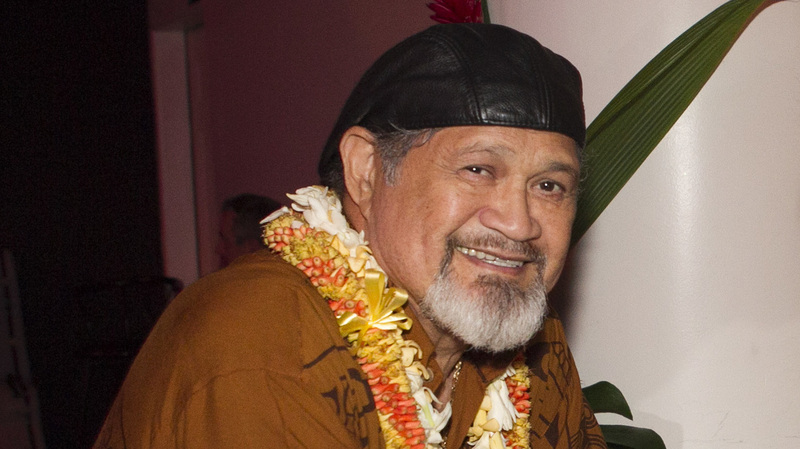 Cyril Pahinui, photographed before the start of a live concert featuring musicians who contributed to the film The Descendants on April 14, 2012 in Honolulu. There's no music in the world quite like Hawaii's slack-key guitar. This unlikely marriage of the Spanish guitar with and Polynesia's rippling rhythms gets its name from the islanders' habit of loosening — "slackening" — the guitar strings to fit the player's voice, leading to a gentler, plumper sound and tunings unlike anywhere else in the world. The effect can often be pleasurably relaxing, or ineffably sad. Cyril Pahinui, a Grammy-nominated master of the form, succumbed this past Saturday to respiratory and kidney failure in Honolulu, aged 68. Pahinui had been hospitalized since Feb., 2016, over complications his widow, Chelle Pahinui, tells NPR were related to exposure to Agent Orange during his time serving in Vietnam. A burly man with a bushy goatee and a big smile, Cyril was a charismatic performer on stage. His large hands enabled him to play bass lines with his right thumb, melodies with his index and middle fingers and harmonies with his ring and little fingers. He had a knack for making even difficult passages seem relaxed, with a smooth baritone voice that was the perfect foil for his altered-chord arpeggios. And as he repeated the traditional tunes, he would displace some notes and add grace notes, so that each pass at the theme was slightly different from what had come before in the song — and from what he'd done in earlier concerts. "It's improvisational music," Chelle says. "Just as a hula dancer can do the hand motion for a wave in a hundred different ways, so can a guitarist play a phrase a hundred different ways. Cyril never did a song the same way twice. He always created the music with the emotion he was feeling at the moment. If he was happy, he could play it quick and lively, but if he was feeling down, he could slow it down and pull at your heartstrings." Cyril's father grew up in a public housing project in Honolulu, teaching himself to play the guitar so well that he became a star on the Waikiki Beach tourist strip, playing a Hawaiianized version of mainland swing music. With that money, he built a home on the opposite side of Oahu Island, in the rural village of Waimanalo, at the foot of the Ko'olau Mountains. It was there that Cyril and his brothers grew up. Gabby would return most weekends from his Waikiki gigs and host outdoor parties — known as a kani ka pila — where he could indulge his first love: slack-key guitar. These gigs would later inspire Cyril to begin the Gabby Pahinui Waimanalo Kanikapila festival, modeled after those early childhood sessions. The Hawaiian Renaissance of the 1970s revived not only the islands' traditional music but also the Hawaiian language and dance. If Gabby Pahinui was the king of that movement, Cyril Pahinui was its crown prince. After their father died in 1980, Cyril and his brothers Bla and Martin carried on the family mission. "Cyril told me that when the parents started the drinking beer," Chelle says, "they'd shoo the children away. But Cyril remembers at age seven sneaking back to look through the fence at Gabby, Sonny Chillingsworth and Atta Isaacs. When he heard these guitarists play, something spoke to Cyril's heart, and he decided right then and there that he wanted to play this music. Before long, whenever he rode in his daddy's car, Cyril would try to tune the guitar until his father said it was right. At age seven, he did his first gig with his father, and his first recording at 15." Slack-key guitar was a family art form in Hawaii. Each clan had its own special tunings that were passed down from generation to generation. (Legend has it that some guitarists kept paper bags over their left hands so competitors couldn't steal their tricks.) But, as enthusiasm for slack-key faded among the baby-boomer generation, Gabby feared that these private tunings might be lost forever; he knew that the jealous guitarists would never divulge their secrets. To combat the secrecy, he developed the ability to memorize the sound of each guitarist and then work out the tuning at home — a skill he passed on to his sons. "Gabby would travel all over the islands and collect all these tunings," Chelle says. "Gabby knew more tunings than anyone; 'Use your eyes and ears; listen and repeat' — that's what Gabby taught, and that's how Cyril learned. Cyril could play fluently play in 17 tunings, including several that no one else today still uses. George Winston says that Cyril is one of the rare players that no matter what the tuning is, 'you know it's Cyril.' "
Winston, the noted pianist, is one of three mainlanders who befriended the Pahinui family and helped to spread the slack-key style beyond the islands. The first was Dave Guard of The Kingston Trio, a Californian who spent his junior high and high school years in Honolulu and helped Gabby produce the album Pure Gabby. Always on the hunt for overlooked musical traditions, Ry Cooder found his way to one of Gabby Pahinui's backyard jam sessions and was awed not only by the virtuosity of the music but also its elegance. The visitor quickly offered to produce and play on some 1974 sessions with the elder Pahinui, released as The Gabby Pahinui Hawaiian Band, Vols. 1 and 2, which included contributions from Cyril and brother Bla. Gabby and Leland "Atta" Isaacs were then invited to play on Cooder's 1976 album, Chicken Skin Music, named after the Hawaiian term for slack-key guitar and the goosebumps it produces. After Gabby's death in 1980, his three sons released one album together, The Pahinui Brothers, produced by Cooder, before going on to pursue solo careers. But it was Winston who came to have the biggest impact on the slack-key scene. "George came to Hawaii on a vacation," Chelle explains, "went to a slack-key festival and fell in love with the music. He met Cyril and said, 'Would you come to San Francisco and teach me this music?' Cyril started recording some songs so George could learn the music, but then George started releasing the recordings to the public. And then George introduced Cyril and the other slack-key guitarists to clubs all over the mainland and Europe. Pretty soon they were making a trip to the mainland nearly every month." Not just Cyril, but most of the top slack-key players benefited from Winston's Dancing Cat label and touring circuit. In fact, Chelle reveals, Winston donated some of Cyril's unreleased recordings to the family to keep Cyril's music-education program alive, and to underscore the National Heritage Fellowship the artist was awarded in 2017 — Pahinui also twice won the Hawai'i Academy of Recording Arts Ki Ho'alu Award, in 1997 and 2017, and was a favorite at the Nā Hōkū Hanohano Awards, often described as the Hawaiian answer to the Grammys. His 1994 album, 6 & 12 String Slack Key, was recognized as instrumental album of the year. Cyril Pahinui's final album, made up of recordings from the '90s and titled Marketplace, was recently released. Updated 4:25 p.m. ET with additional information.